The historic Bird-In-Hand gold mine pictured in 1884. 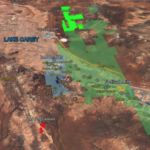 Terramin Australia’s restart of a historic gold mine within the Adelaide Hills project area in South Australia has taken a step forward following the completion of a $1.1 million managed aquifer recharge (MAR) trial. MAR technology is used to ensure sufficient irrigation of the Bird-In-Hand mine site while avoiding impacts to local water users. Bird-In-Hand is a historic gold mine that produced over 30,000 ounces of gold between 1881–1889. Terramin has pegged capital costs for Bird-In-Hand’s restart at around $25.6 million. The base and precious metal producer purchased Bird-In-Hand as part of its 3702-square kilometre Adelaide Hills gold tenement package in 2013 and updated the mine’s resource in 2018 to 650,000 tonnes at an average yield of 12.6 grams a tonne of gold for 265,000 ounces. Terramin holds 12 exploration tenements within the Adelaide Hills project area. 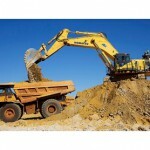 Terramin now expects to achieve its mining lease application for the project to be completed in the second quarter of 2019. “The great initial results from the MAR trial are a real milestone for Terramin and confirms much of the research and modelling undertaken by the company over the past five years,” said Terramin chief executive Richard Taylor. 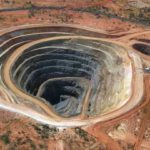 Terramin explained at the Paydirt 2019 South Australian Resources and Energy Investment Conference it was making efforts to keep the mining land largely hidden, having employed landscape architects for this purpose to better blend the mine into the landscape. Over 40,000 trees have already been planted at the project area, while drilling will also be confined to daylight hours. 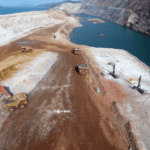 “Terramin has completed a MAR trial for the restart which demonstrates the local aquifer is suitable to accept reinjection of water inflows expected during mining,” Taylor said. “The aquifer has performed to the model developed over the past five years.